Four-Stamen Sibbaldia is is perennial, low, tufted herb. 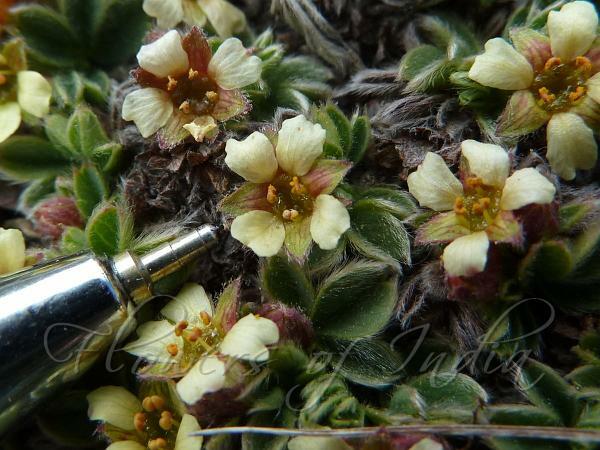 Pale yellow flowers usually arise singly, usually unisexual, 4-8 mm across. Sepals are 4, triangular-ovate, tip rounded or pointed. False-sepals are lanceolate or ovate, minute, nearly equaling sepals, tip pointed to long-pointed. Petals are 4, pale yellow, obovate-oblong, nearly equaling or slightly longer than sepals. Stamens 4, inserted away from broad, 4-fid disk. Style lateral. Rhizome are robust, round. Flowering stems are 2-5 cm tall. Basal leaves are 0.5-15 cm including the stalk. Stipules are brown, dilated, membranous, hairy below. Leaf-stalk is white hairy. Leaves are 3-foliolate, leaflets green on both surfaces, obovate-oblong, 5-8 x 3-4 mm, both surfaces white hairy, base wedge-shaped, tip is broad, 3-toothed. Achenes are hairless. 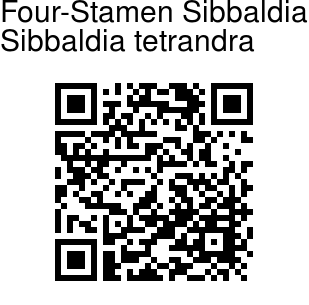 Four-Stamen Sibbaldia is found in forests, meadows on mountain slopes, rock crevices, in China, Mongolia, Nepal, Pakistan, Russia (W Siberia). In India it is found in Ladakh and Sikkim at altitudes of 3000--5400 m. Flowering: May-August.